Home Community fitness How does a community virtual fitness challenge and race boost wellness? 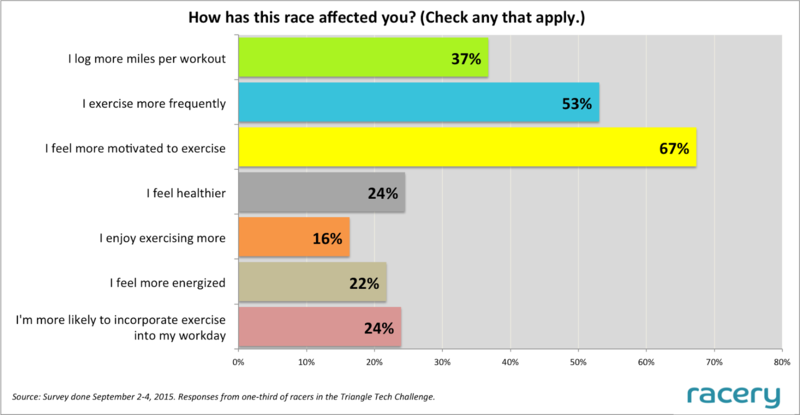 We recently surveyed racers in the Triangle Tech Challenge, a multiweek virtual race between 43 teams from tech companies in North Carolina. According to survey respondents, the race had significant positive effects on both individual habits and people’s social networks. Racers reported broad positive effects of the virtual race on individual bodies and minds. “Motivation” is already the word we hear regularly from racers talking about Racery, and it’s fascinating to see that fully 2 of 3 racers say this virtual race boosted their motivation. More than half said they exercised more regularly because of the race. And 22% of racers feel more energized because of the race. That’s all good news, but we’re even more excited by the virtual race’s effect on the racer’s social network. It turns out that racers were talking with colleagues and family members about the race. 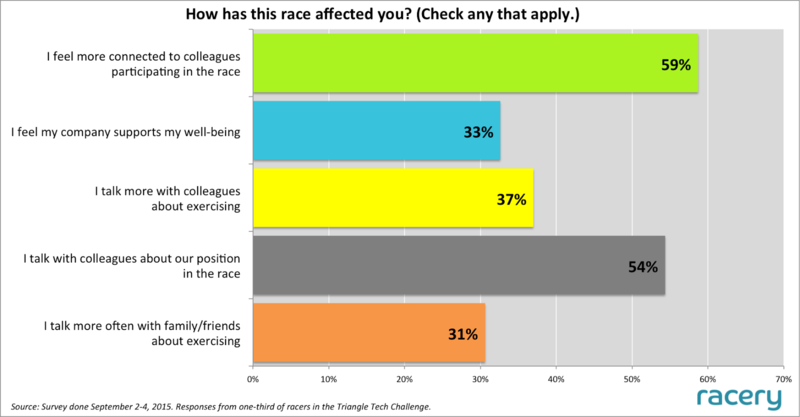 And nearly 2 in 3 racers felt more connected to colleagues who were also racing. These social effects are particularly important because a) health science increasingly indicates that the attitudes and decisions of a person’s social network significantly shape that individual’s health decisions and b) few wellness programs currently move the needle at the level of a company’s overall culture. As racers talk about the virtual race day-after-day with colleagues, friends and family, the culture that surrounds and shapes them gets rewired. Rewired not just to focus on fitness, but to enhance the psychological and cultural traits that contribute to an active, exciting life — action, motivation, intentionality, accountability, and teamwork. In total, 53 racers responded to the survey. Get in touch with our virtual race gurus about organizing a virtual race or fitness challenge for your company, organization or community. Or take ten minutes to build your own custom virtual race route right now and share it with your group!